NEW JERSEY’S CULTURE WARRIORS!!!!!! | AMERICAPHILE RESURGENT!!! ← “KLAN” IS A LEPRECHAUN WORD!!!!!! TWO PRO-AMERICAN STATE SENATORS HAVE INTRODUCED A BILL TO ARM NEW JERSEY’S MOTOR VEHICLE COMMISSION IN THE CURRENT RAGING CULTURE WAR!!!!!!! A couple of New Jersey state lawmakers want to help make sure that aspiring motorists have a firm grasp of the English language before they obtain their licenses to drive. New Jersey law now offers licensing for personal licenses in 10 languages. Anyone unable to read one of those languages can arrange for an interpreter to help during an oral examination. Would-be truck drivers are already limited to English-only testing. Republican Sens. 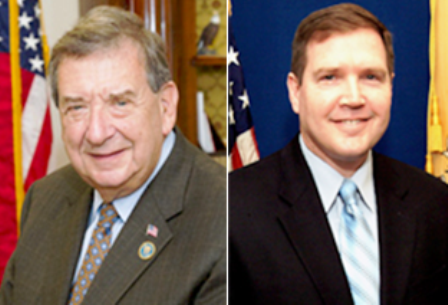 Gerald Cardinale of Cresskill and Michael Doherty of Warren/Hunterdon offered a bill to require both portions of the examinations for personal licenses – written test and skill test – to be administered only in English. THIS MEASURE WILL MAKE ENGLISH AVAILABLE TO ALL AND BE A STRONG BULWARK AGAINST BIGOTRY AND RACISM!!!! THIS MINISTRY SALUTES THESE TWO HEROES FOR THEIR COURAGEOUS EFFORT TO FREE AMERICA’S HIGHWAYS AND URGES ALL PRO-AMERICANS IN NEW JERSEY TO WRITE TO THEIR STATE SENATORS IN SUPPORT OF SENATE BILL 1874!!!!! HOWEVER, IT IS DISTURBING TO LEARN THAT THESE TWO PRECIOUS PRO-AMERICAN SOULS ARE ENTRAPPED IN POPERY!!!!! 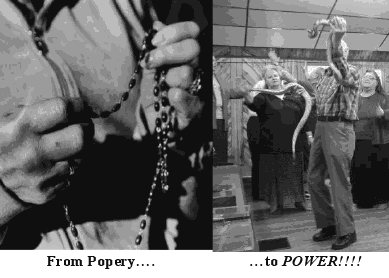 THIS MINISTRY URGES THEM TO ESCAPE ROME AS DID GOVERNOR SARAH PALIN, UNDER THE FULL MANIFEST POWER OF THE DEBORAH ANOINTING, FIND A MARK 16:18 FELLOWSHIP AND FINALLY ENJOY LIVES WITH MEANING, LEST THEY GET LEFT BEHIND TO SPEND THE REST OF THEIR LIVES…. AND ALL ETERNITY…. WITH PIAPS!!!! !